Global trends, from climate change and population dynamics to food, water, and energy scarcity, threaten to complicate global security, diplomatic efforts, and development policy. In the United States we are increasingly responding to these trends, rather than anticipating and planning for them. This Earth Day, as we reflect on the past, we recognize that we have made significant gains. In the United States, leaded gas has been phased out, the Clean Air and Clean Water Acts have brought significant gains, and bald eagles and gray wolves are no longer on the endangered species list. But we are in a new era, the Anthropocene, where environmental impacts are being driven by human action – and those impacts are reverberating globally. We are in this together. In the years ahead it seems likely we will experience more climate-related changes, including quick hits – floods, disease outbreaks, and food price increases – and slower-burning impacts like spells of droughts, food price volatility, and environmental degradation. These shocks and stresses will be exacerbated by underlying trends and the kind of multisystem failures seen in places like Syria may cause fragility elsewhere. We need a more intentional and consistent analysis of the ways in which environmental, political, and societal trends are likely to evolve, interact with one another, and influence the development landscape. Today, about 1.2 billion people live in areas experiencing water scarcity. More than 1.3 billion people don’t have electricity, and about 2.6 billion use wood and other solid fuels for cooking, leading to deforestation and illness from indoor air pollution. In these already fragile communities, environmental shocks and stressors will lead to even poorer health and slower economic growth. A better understanding of how global demography is likely to evolve over the coming decades, for example, could help us identify areas ripe for focused policies to promote and support democratization, improve economic productivity, and conserve important habitats. Population age structure – the relative ratio of children, adolescents, working-age adults, and seniors – can exacerbate stresses and carries important implications for a country’s political, economic, and social well-being. Over the past four decades, states with youthful age structures have been the most vulnerable to outbreaks of civil conflict and political instability. Younger states are also more likely to have autocratic regimes than those with relatively older populations. And rapid population growth has had one of the strongest correlations with biodiversity loss. Incorporating demography into planning could maximize the impact of development investments, make humanitarian response more sustainable, and provide a pathway for incorporating other kinds of futures analysis into foreign policy. A recently released report calls for a new approach to addressing interconnected security risks as we plan for a post-2015 world. A New Climate for Peace, commissioned by the G7 and authored by the Wilson Center and other partners, highlights seven compound risks that make climate change a serious threat to development. These include local resource competition in places where demand, especially for water and arable land, is growing and where dispute resolution mechanisms are ineffective. Livelihood insecurity is also a significant threat for those who rely heavily on natural resources, like subsistence farmers. Migration, which can be triggered when livelihoods are eliminated, could have spill-over effects on the fragility of neighboring states. Meanwhile, the unforeseen consequences of otherwise well-intended climate policies could challenge stability in fragile and conflict-affected states. The report makes clear that single-sector interventions will not deal with these compound risks, a message that was cited by the G7 foreign ministers. “We agree on the need to better understand, identify, monitor, and address the compound risks associated with climate change and fragility,” they said in a communique. “Integrating climate-fragility considerations across foreign policy portfolios will allow G7 countries to better assess climate-related security challenges and to assist other countries in preparing for and responding to these risks.” To do so, the foreign ministers will establish a working group to evaluate the study’s recommendations, an important step towards implementing a coordinated, integrated response. Because of the report’s unique focus on influential policymakers – G7 countries represent roughly two thirds of global development funding – it’s an important recognition of the “stove-pipe” problem. In order to mitigate the effects of climate change, more cross-sectoral coordination is needed. What’s more, there are significant co-benefits that can be reaped by such coordination. The rate at which environmental change, resource scarcity, and population dynamics are affecting policies, programs, and, ultimately, people’s well-being, is unprecedented. Furthermore, the interconnected global economy causes ripple effects around the world, from food prices to electronics. An estimated 20 percent of today’s global economic output is based in countries that face high risks from the impacts of climate change by the year 2025. The world’s major economies ultimately have to respond to these challenges. 2015 is a watershed year for such a response. The third World Conference on Disaster Risk Reduction was held in Japan in March during which a new framework was established for dealing with disasters. In July the third international conference on Financing for Development will take place in Ethiopia. In September, the Sustainable Development Goals will be launched internationally. In December, the UN Framework Convention on Climate Change will hold a much anticipated summit in Paris. And finally, in 2016, the World Humanitarian Summit will take place in Istanbul. It’s important that these meetings set a realistic and ambitious agenda for the environment and humanity, which are so intertwined. Together they represent a framework that will guide much of the international community’s development and humanitarian efforts for the next decade. This is a pivotal moment. We have a unique opportunity to think about how to respond to global trends in a more cohesive way than ever before. Sources: BBC, Ensia, The Group of Seven, International Energy Agency, Maplecroft, UN Department of Economic and Social Affairs, UN Framework Convention on Climate Change. 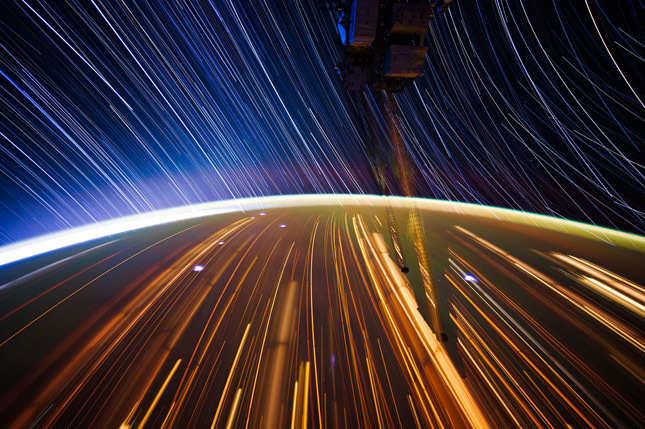 Photo Credit: Light trails from International Space Station Expedition 31, courtesy of Don Pettit/NASA.